L&E gave us such a warm welcome. This allowed me to settle Eve, and leave confidently knowing she would be fine. It was one of the best weeks of her life. Over the past 10 years we have had hundreds of children come to spend their summers with us and with each child comes a story, this is Sierra’s story. Sierra is from Kentucky in the USA and first came to L&E at the age of 14 in 2014. Her grandmother Denise made the trip up north to drop Sierra off at camp as she lives in London and Sierra spends her summers there. After being bullied and picked on at school Denise wanted her granddaughter to grow up knowing that she didn’t need to “conform” and feel the need to try and “fit in”. Sierra describes how nervous she was about coming to camp as she thought she would be an outsider being the only American. 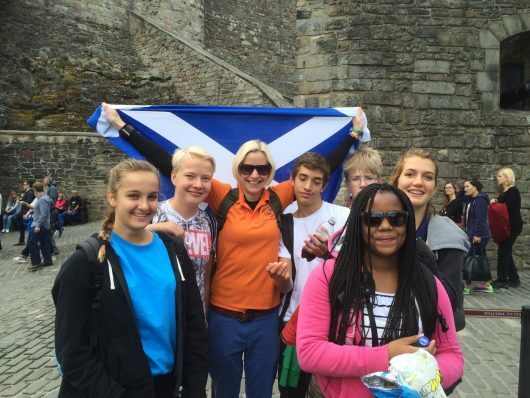 She very quickly realised how inclusive the camp was and how her nationality or background didn’t matter. Sierra later described the best part of L&E was the way in which she was able to interact with everyone regardless of age, gender or background. The following year, as well as coming back to camp for 2 weeks Sierra, along with 5 other teenagers from across Europe booked onto the Teen Travel UK trip. Teen Travel is a unique programme for 15 & 16 year olds which allows teenagers to learn the art of travel in a safe and supportive environment. Sierra describes Teen Travel as “helping her with real life problems” and although she learns a lot from her parents about how to budget and organise transportation it isn’t the same as “experiencing it for yourself”. Living and travelling with others is all about compromise and Sierra found this to be a big part of the trip. Knowing that what one person wanted wasn’t the only thing that mattered and it was the whole group that needed to agree – “teamwork makes the dreamwork!” Furthermore, being accountable and learning valuable practical skills translated into Sierra having the ability to navigate the international journey to camp each year. Speaking about the overall effects L&E had on Sierra, she expressed that the experiences she gained from the multiple programmes she attended prepared her for college largely due to being exposed to people from different cultural and religious backgrounds. Without these experiences she felt that her transition to college would have been “difficult”. Sierra is currently undertaking an undergraduate course at the University of Kentucky in Animal Science and Technology and her goal is to become a veterinarian, and if you ask her grandmother she will describe this as her “destiny”. It has been an absolute pleasure playing a part in Sierra’s journey and we wish her all the very best for the future and hope to see her back at L&E one day…perhaps wearing an orange polo shirt! Sierra’s summer experiences with L&E made a tremendous impact on her self-esteem and sense of being. Meeting, mixing, and bonding with young people from all over the world helped her to establish a real sense of belonging and an understanding of the privilege and responsibility that comes with being a citizen of the world. L&E creates a microcosm that consistently exemplifies what real community is. In this space, the young people are able flourish without judgement or ridicule or constraining social norms. Kind consideration for one another is the underlying vibe or mantra. With this as a foundation for her summer experiences, Sierra has been able to fully explore what being the best version of self looks like, feels like, and sounds like. 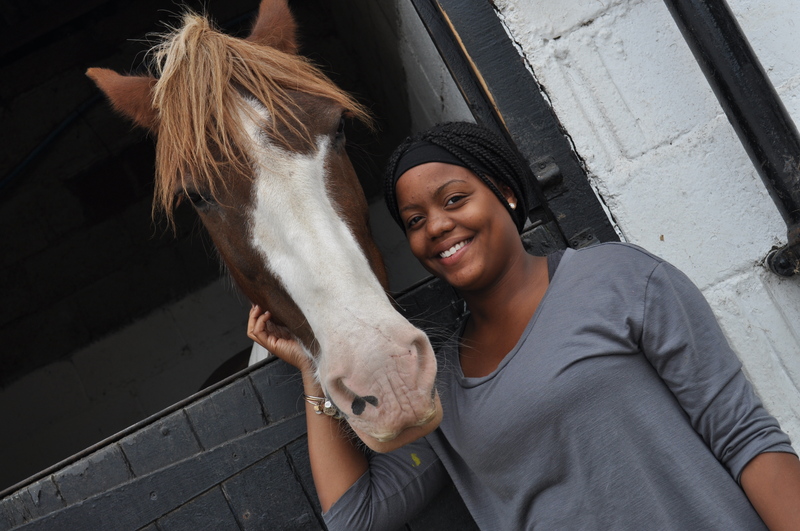 Her experiences with the extra activity (horse riding) helped her “find” her true passion. The encouragement from the instructors and the opportunities she had to bond with the horses simply sealed her destiny. Sierra will work with animals – full stop. Before going to L&E she was being bullied and picked on at school. The decision to send her to L&E was purely predicated on the fact that we did not want her to grow up feeling like she needed to conform or “be like” just so she could “fit it”. When we arrived day-1 of her first year; I was helping her unpack and group of girls popped around the corner asking her name and where she was from. Sierra froze and said nothing, so I did all the introductions. I remember thinking “come on Sie get out there” and then I just left the room. Within 5 minutes, she and the entire group came bouncing down the stairs and she was on her way. As it turns out, her experiences with L&E have been gateway experiences. Every summer when she returned from camp, she was more confident and secure and capable with a very grounded sense ofwho she is and what she wants from life. As a part of teem travel, her self-awareness expanded even more. Teen travel is a truly unique experience because it deems them fully accountable for what happens next. It becomes a good experience only if they work to make if a good experience – as a team they plan, organise, budget, etc. The fact that they are responsible for every single aspect of the allows them to make very adult decisions being fully accountable for the outcome. The practical skills learned as a part of Teen Travel meant that we were more confident in her ability to navigate the international journey to camp every year. The L&E experience has been a game changer for Sierra. She owns and rocks her self-confidence with ease and grace. That confidence is no longer predicated on the “if they like me”; it is now firmly rooted in the “I will be fine if they don’t”. Her view of the world and its infinite possibility is tremendously expansive. She clearly understands that living life is about the journey, as the destination is just a marker at a point in time and ever changing. I can never in 1,000 years thank the L&E team enough. 1: How did you feel about coming to camp before you arrived? When I first found out I was going to L&E I was excited because I knew it was going to be a great experience but when I arrived there I became very nervous and overwhelmed by the amount of people that were there. Since I was from America and many of the people there were from Europe, I thought that I would be an outcast. 2: How did you feel about camp after? After my 2 weeks of being at camp was over I was very sad. I had so much fun meeting people, participating in activities and games and going horseback riding. When my time at camp was over that’s when I realized how close I had become with the campers and tutors, it felt like I was leaving my second family. 3: What’s the best thing about camp? The best part of L&E would have to be how involved the camp is. Most camps I have been to, you would find a small group of people you connected with and stay with them the entire time. With this camp all the activities and games were made to have everyone involved. Here I was able to interact with all people of different age groups and ethnicities and still have fun. 4: What did you learn on Teen Travel? Teen Travel taught me how to live with others and how to compromise. I’m used to living with family members but had never stayed with people I had just met. I noticed how many times everyone had disagreements over what we wanted to do and what we felt we should spend our money on. Being in these situations made me realize that what I wanted wasn’t the only thing that mattered and that it is important to learn how to work well with others. Teamwork makes the dream work. 5: What would you say to someone who was thinking about doing TT but was undecided? I would tell them that they should give it a try because it will help them with real life problems. Where I’m from my school never taught me how to budget and find my own transportation and accommodations. The little bit that I did know about these things came from what my parents told me but it’s not the same as experiencing it for yourself. Along with learning all these things you also get the chance to adventure out, meet new people, travel to new places and have fun while doing it. 6: Any other thoughts about L&E? I believe L&E is a great place for everyone. I was a very introverted person and L&E helped me step out of my comfort zone and get used to meeting and being around a lot of different people. 7: What effect did L&E have on you? In my opinion I believe that L&E has prepared me for college. If it wasn’t for the camp and teen travel I would not have been exposed to being around and living with multiple people from different cultural backgrounds and religions. Without L&E I feel like my transition into college would have been very difficult. The children began their first day of week 2 North Camp with a hearty breakfast of delicious British crumpets and toast. Afterwards they partook in the iconic L&E tradition of morning dodgeball, in which a small tournament was established, and the children fought to take their team to the top. The children then chose one of three options for the morning activities, netball, den building, and papier mache balloon making. Having refilled our engines, the groups then chose their second activity of the day. Hockey was very popular, however somewhat overshadowed by an excellent scavenger hunt created by Harriet, where the children had to solve a riddle in order to get all the clues to find the hidden prize. The children in creative let their imaginations run wild when creating pompom hairbands and mysterious characters. After a dinner of fish fingers and chips, the children prepared for arguably one of the best nights of camp (amongst others), icebreakers! The campers were split into teams in order to take on a series of exciting and hilarious icebreakers, which ultimately ended with determined campers yelling ‘chubby bunny’ in an attempt to win the final game. After a great evening, the campers settled down with hot chocolate before bed, concluding the first day of north camp week 2. With a hearty British classic of bacon ‘sarnies for breakfast, some very energised campers with made their way over to the sport’s hall to commence the morning with an exhilarating game of dodgeball. The tutors verses campers match saw the tutors quickly annihilated, soon realising that winning against 72 campers is quite the challenge! The day opened with scuba diving, which continued throughout the day to ensure that all campers got the chance to snorkel with the infamous Scuba Steve. Those partaking in creative embarked on an incredibly enthusiastic session of karaoke, accompanied by some gorgeous solos and choreographed dances. Those opting for adventure got involved with some archery (a special shout out to Sara who scored a perfect bull’s eye!) which proved very popular. Regardless of some rainy outbursts in the morning, sport continued with a game of five aside football in the sports hall which resulted in sweaty faces all around! 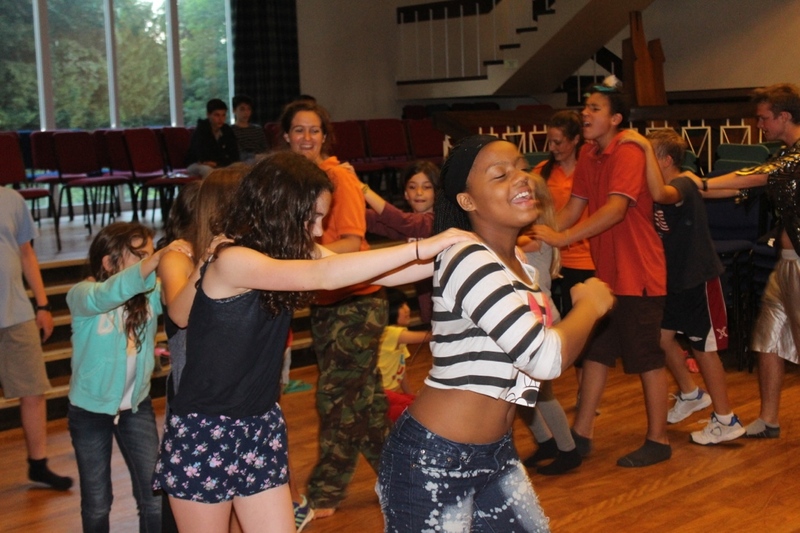 With another stereotypically British meal of beef stew, our campers returned to their afternoon activities. Scuba diving continued, whilst some sunny outbreaks allowed for a fantastic game of tennis for those opting for sport. The creative session ran with a variety of options – continuing papier mache, creating photo frames and ‘ancient’ art pieces fashioned into treasure maps, there was an option for everyone! Activities were concluded with some free time in the pool, exhibiting some fabulous pool-acrobatics and water fights. Evening activities consisted of a warm up game of catch the flag and a series of competitive team games, prior to our greatly anticipated weekly campfire! Having chanted some of our campfire classics, groups took to the stage to perform, many of which featuring national anthems, whilst others sung solo pieces, seeking reward for some coveted marshmallows. With marshmallows toasted, and hot chocolates finished, our very happy campers go to sleep content and tired after yet another busy day at North Camp, in anticipation for the fun to be had tomorrow. 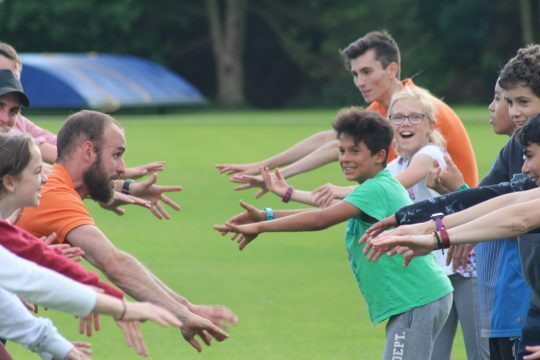 As we come to half way through week 2, the new campers have really settled in to life at L&E, tried lots of new activitities and found new friendships. After the jolly singalongs at last night’s campfire the kids woke up bright and full of energy ready to take on another day of fun. Fueled by boiled eggs and toast, dodgeball got everyone working together before splitting off for morning activities. Creative was outdoor chalk drawings and we added lots of colour to the basketball court and walls. The sport option was rugby and with an enthusiastic bunch of campers, the game was very close. We had a delicious adventure option onsite, making muffins in oranges on the campfire, and as it was so popular we offered it again in the afternoon. The English group also had a chance to bake after discussing food, restaurant role play and exploring menus – their jam tarts were scrumptious! With canoeing an option in both morning and afternoon lots of campers had the chance to give it a go – some for the first time. We had a slalom course, a couple of games of water polo and even sang head, shoulders, knees and toes while standing and jumping in the canoes. We had a couple of kids falling/jumping out and we all went swimming at the end before heading back for lunch. Filling up on bangers and mash, salad and fruit the campers then had a little free time before afternoon activity choices. After the horse riders and canoeists set off and the campfire was relit the rest of the camp had a choice between sport and creative. Ultimate frisbee was the sport option with just the right amount of competive spirit to keep it interesting. For creative, the campers were also up and about with a dance session then a yoga class. They were taught a piece of choreogphy, some floor work and had the chance to freestyle and work in pairs. The yoga session left our brains and bodies feeling calm and rested with some giggles when our balances didn’t quite work out. With some free time before dinner, lots of the campers chose to go to the pool to squeeze in a little more fun before a dinner of pasta and garlic bread, with most going for seconds. After a very physical day, we were happy that movie night gave us a chance to chill out in our pjs. With this week’s theme being Spy Games, our movie of choice was ‘Johnny English’, which the campers thought was hilarious. It was soon time for hot chocolate and a good nights sleep ready for tomorrow’s adventures. This morning we had breakfast as normal at 8:15 followed by a game of dodgeball between 9 and 10 am, to warm us all up for the days activities. The sport activity for this morning was waterpolo which was held at the swimming pool. A group went out rock climbing as the mornings adventure activity, and the rest of the adventurers played a game of capture the flag and the creative group had a morning of nature art. This concluded the morning activities before lunch. The afternoon activities consisted of a second group going out rock climbing for the adventure activity, and the rest of the adventure group going out to do some tree climbing. A small group of 8 had an afternoon of football out on he field which was very enjoyable session even though the number of players were limited. The waterslide was a whirlwind ride of opportunity and adventure which was run by a few of the camp tutors while the rest prepared for the evenings theme night. The theme of this week was ‘Spy Night’ and was a huge evening event which took place at various stations around the school. We had a number of mysterious yet fun and energetic games and activities set up by our L&E staff. Games like, Water balloon target practice, Interrogation room and a small casino where the campers could bet skittles on the games they played. Tonight was a great success for all the staff and campers and there was no better way to end the night with a cup of hot chocolate in the dining hall with the whole group before bed after an exhausting day. What a day to finish off the second week of Learn & Experience North camp! It has been an epic week with plentiful laughter and kindness at the abundance. Can’t be more proud of the group of young people that have attended this week. They have risen above all tasks and taken on activities like absolute professionals. We started the day with a wholesome cooked breakfast, a select few were picked to go on the outdoor adventure to Brimham where they were able to clamber across rocks and be true outdoor explorers. While they were away the others were able to let loose in the dodgeball hall. Some for the last time. Then teams were split, one for creative to create masterpieces of art and crafts! The others were sent out to fiercely battle on the rounders pitch! Lunch was consumed and the everyone joined in to feast on a rather quality spread of cooked food and salad. Soon enough, after some free time, we regrouped as a whole to see which group could create the ultimate bin bag extraordinaire outfit. A catwalk was set out and 7 fabulous looking individuals strutted their stuff in their bin bag masterpieces. Finally Albane and Fergus were the winners with their strut and truly creative outfits! Everyone sat around for what was the final supper for many, afterwards packing their bags and preparing their Oscar outfits! It was an excellent evening!! Oscars took off with a wham and a bam. We had a trio of gymnastics, a piano recital by Zoe, the polish national anthem (lead was Karol, taking a magnificent stand whilst backed by a dozen enthusiastic fellow campers), Zoe-Marie lead a French solo, Fergus and Simon lead a chant! We finished the evening with a quality montage of the week in photos and videos and a raving disco where the campers were cutting shapes and showing their skills! Hot chocolate and off they all went to bed with high spirits! This weekend the L&E North Camp, happy campers travelled to Whitby. A lovely countryside town where the streets a lined with fish and chips shops and old sweet shops, with ice cream stalls dotted in between. It was a cloudy but warm day and the children roamed the streets enjoying what the town had to offer. Some of them braving to feel the temperature of the sea and others climbing the 199 steps to get a panoramic view of the town. In the evening the campers settled in with some popcorn to watch The Avengers and then it was hot chocolate and bed. We had many campers leave us this weekend and there wasn’t a dry eye in the house when new found friendships had to say their goodbyes. But, next summer is in the distance and there has already been plans to reunite at L&E 2019. This evening we welcomed many new campers to the North and there were many smiling faces as they enjoyed their BBQ dinner. The games on the field we very competitive but broke down some of the ice for new friendships to blossom. With a quick hot chocolate before bed, campers are in their beds dreaming of the adventures they will have this week. With the sun beating down on yet another (surprisingly) gorgeous July day, the commencement of North Camp 2018 could not have started on a sweeter note. As the students bounded into camp, the tutors excitedly awaited their arrival. 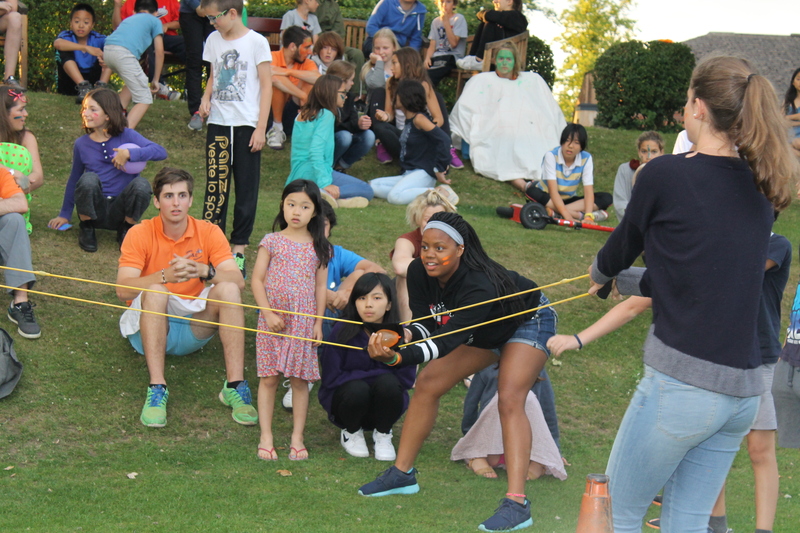 With some strenuous exercise carrying some rather heavy suitcases up the seemingly never-ending four flights of stairs, we were all rewarded with a wonderful barbecue, allowing campers both old and new to catch up and familiarise themselves with their fellow campers. As the chatter in the rooms slowly softened, the lights dimmed and the hubbub of the school eventually drawing to a close, North Camp 2018 looks to be our best year yet. This morning started with a hearty breakfast of crumpets and honey which went down a treat and filled the children’s bellies in preparation for their first full day of camp. The warm-up was, the ever popular, dodgeball and as usual the children were victorious!! The morning activities to choose from were basketball, canoeing and den building and, with the sun high in the sky, the children were keen to get started. After a wander through the extensive grounds the den builders found the ideal location for their grand designs. Not only did they manage to build some amazing structures they also managed to decorate them. The children showed some awesome teamwork and reminded us that in fact – teamwork makes the dreamwork! Tim’s insatiable ability to get the basketball from ANYWHERE was quite outstanding but little Miguel was able to swish the ball from left, right and rhubarb. The canoeists spent the day on the water both in both the morning afternoon and again, we were lucky with the weather. There was some falling and jumping in the water at the end as always! The afternoon’s creative session was decoupage flower pots and tissue flowers to decorate their new rooms, adding lots of colour across camp. We also introduced the campers to this week’s World Cup theme and learned a bit about each other. Today’s sport continued with an afternoon football tournament, in the penalty shootout Mani was amazing – his tenacity earned him “Person of the Match”. Monday night means only one thing – ice-breakers! New records were set in many categories. Issac has obviously been practicing since last year and crushed the old chubby bunnies record and managed to get 17 marshmallows in his mouth whilst still being coherent. Harriet (tutor) managed to catch an egg which was a new record for her, unfortunately the egg broke all over her! We finished icebreakers with the egg drop where each team designs the safest way to drop an egg while keeping it intact……..3 out 8 eggs made it to the bottom! With new friendships made, everyone got into PJs for hot chocolate before bed. As the sun rose on the 2nd full day of camp this year, campers woke up bright and early, prepared for another action packed day. Breakfast offered up the treat of some bacon, tomatoes and toast, the perfect fuel for the following dodgeball session. The kids dodged, ducked, dipped and dived through the mornings warm up activity, and left the dodgeball hall raring to go for the plethora of activities on offer for the morning session. The morning activities were varied, but all proved popular amongst campers. For the English lessons a paper plane making, fact finding mission, all with the focus on the past and future tenses, transitioned into a summer themed singing activity with the focus on adjectives. Our sport enthusiasts tackled the challenge of touch rugby, our adventure campers had the exciting experience of scuba diving in our very own pool with a professional instructor, and the creative group were focusing on making flag and bunting (it’s almost as if there was a big game coming up. The afternoon activities of campfire preparation, ultimate Frisbee and creating friendship bracelets were short, but immensely popular, as we needed to fit time for our first giant water slide session of the summer. The old favourite L&E waterslide was back, and oh boy was it back with a bang! Who’d have guessed that a hill, tarpaulin, washing up liquid and sumo wrestling could be the ingredients for the perfect summer afternoon? After a dinner of enchiladas, it was time for the inaugural campfire of 2018. We boochickarooed our way through multiple campfire classics, and were then treated to some magnificent performances from campers and tutors, with a particular shoutout going to Greta for her superb rendition of Shawn Mendes’ ‘Stitches’. Finally, we had the big screen up and the seats in place, it was time for the game, the big one (or warm up for tomorrow), France vs Belgium. A great atmosphere, largely created from having campers from both nationalities, ensured the game was cheered on in a friendly but competitive spirit. After the match ended we finished with some hot chocolate, and all tired after such a fun filled day, retired to bed, looking forward to continuing with the L&E adventure tomorrow. Today, yet again, we had beautiful weather in sunny Yorkshire. After a a delicious breakfast of fresh bread rolls and toast with cheese and ham we embarked on the morning warm up of dodgeball! The game was very intense and as the balls wizzed and whirled around the sports hall children dove and rolled out of line of fire. The morning activities were very exciting. The adventure option was canoeing and the children basked in the glorious sunlight as they paddled through the lake. In the spirit of the ‘Word Cup’ they played football on the water, manoeuvring their canoes around some tricky turns to score goals against each other. However, the children spent more time in water capsized rather than in their boat and ended their trip with some dives and flips into the lake. It was so clear that they could see the fishes swimming along the lake floor. Our sport option, was a game of kickball which is a cross between football, rounders, and baseball. The children rally enjoyed the competitiveness of the game and there were some outstanding sportswomen and men amongst them. Durning the English lessons the students wrote stories and busting out some awesome acting skills during a game of charades. We are hoping to see more of this in their presentation later in the week. In the creative activity the kids were painting some graffiti walls, working in groups to create a wall with their names and a picture. A few people also designed their own football kits. In the afternoon the kids did movie making and a dance routine. In the afternoon the children also had the opportunity to chose a second adventure option of a very exciting scavenger hunt. Clues were dotted round the school and they had to find them, but after each clue there were more items that the group had to carry and/or wear that would make it harder for them to reach the next clue quicker. Out was a very entertaining display of determination and learning, mixed with a lot of fun and laughter. Sports in the afternoon lead with relay races between the pizzas, the doughnuts, the burgers and the marshmallows. They competed in events such as the egg and spoon race and the three legged race. It is noted that that no harm came to any eggs during the competition. After a delicious dinner of homemade pizza, the group split up, some people were watching the movie Coco, and others watched the horrendously shocking football match where most of us cried. Although it wasn’t a great day for England and their World Cup dream, at L&E the children have gone to bed with bellies full of hot chocolate and excitement for what the next few days of camp will bring! The sunrise brought a overcast and cool morning revitalising there children as they bounded down the stairs and started off with an hearty serving of scrambled eggs, beans and toast to fuel a busy day.The morning session proved enjoyable and challenging covering the three zones. The sport option being split into two activities the first being handball. Teams separating themselves into 4 groups in a torment fashion, the competition was fierce but the Muchachalataas came out on top. Following this was bench ball a camp favourite where the children had to pass a ball to a team mate on a bench and join them till none where left on the field to win. The adventure choice for the day was thrilling rock climbing testing the children’s nerves and stamina conducted at Down Holmes quarry. Scaling walls of varying degrees of challenge coming back to camp exhausted but with a sense of achievement. The creative section consisted of game creation and owing to the season being the world cup these mainly revolved around football. One of the standouts consisted of a box painted and designed like a field and pompoms used for balls and straws to move it. A simple and enjoyable game that all could play. The afternoon session matched the intensity and enjoyment of the first with sports involving tennis under the cleared sky. Ordering the children by experience across three fields so all could enjoy and learn as they played. This followed by indoor hockey coming down to a golden goal to break the tie.The creative options has a edible version where the children followed a tutor through the baking and design of biscuits. Following a simple but direct recipe the end result being delectable and shared to their peers delight. Rock climbing proceeding through the day. Once dinner consisting of of pasta and rice ended ,they would needs its energy, theme night commenced. In this case the night revolved around the world cup. The children where separated into eight countries painted themselves to their nation and went trough eight activities organised by tutors. These consisting of flag naming, Tabletop football and commentating, catch the tears, fan celebrating, balloon keepsiupsies, slow motion dives and relays. All of these collecting red cards to be used at the finale, a penalty shoot out. These cards could be exchanged for extra shots in the competition beyond the normal number. The air was charged but silent for each shot and explosive in its completion. In the end five teams being joint victor. The night came to a end with exhausted bodies but smiling faces looking forward to the next day. This morning began with many exhausted, yet happy campers, all of whom had spent their previous evening running around enthusiastically during the World Cup theme night. After enjoying a filling breakfast of bacon, toast and fruit, the day kicked off with the usual dodgeball warm up activity, followed by four exciting morning options. 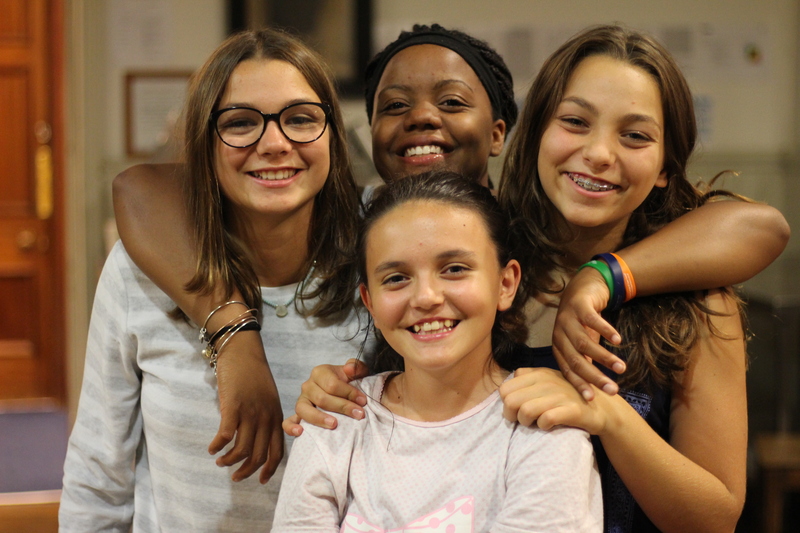 The students taking part in English lessons worked hard interviewing and asking their fellow campers and tutors questions such as ‘what is your favourite activity at camp?’ before successfully writing and compiling their own L&E newsletter together. The other morning activities to choose from were campfire cooking, postcard and friendship bracelet making and rounders/indoor football. The adventure option of campfire cooking was incredibly popular as the campers enthusiastically participated in building the campfire, before making chocolate chip and sultana muffins, encased inside orange skins. The creative use of orange skins was a huge success and provided the muffins with a hint of orange flavour, but despite them being incredibly delicious, the muffins did not hinder the appetite of our campers. We then enjoyed a delicious lunch of traditional fish and chips, before commencing the main event of the afternoon – the traditional L&E triathlon. The campers were divided into teams of three, with each person taking part in either the swim, run or the obstacle course. Overall the triathlon was a huge success, with prizes awarded to the winners of the bronze, silver and gold categories. In the end, the night concluded with the famous L&E ‘Oscars’ as many campers were nominated in various categories such as ‘Happiest Camper’, ‘Most Helpful’ and ‘Be Kind, Be Kind, Be Kind’. A huge congratulations to all of the winners and nominees, especially for Aune, the week one winner of the prestigious ‘Star Camper’ award. The night also included special performances from our talented campers, with singing, dancing and gymnastics performances. The disco was definitely a highlight of the week and allowed all of the campers to celebrate the end of a successful first week at L&E 2018. And in the blink of an eye the first week of L&E 2018 was over. The children were sad to see campers depart on Saturday morning but their eyes soon dried as they looked towards the trip to York. The weather was kind to us as we made our way to one of the most beautiful cities in Yorkshire. The children visited old sweet shops, enjoyed the street performers and had a lovely lunch by the minster. It was lovely to see all the campers chatting and enjoying each others company in the presence of such history and culture. On return to Aysgarth the children were treated with a lovely evening meal and then settled down to watch ‘The Greatest Showman’ on of the staffs favourite movies. The children enjoyed their attempts to sing along to the catchy tunes. As Sunday arrived there was a obvious build up of energy as the children prepared themselves to welcome new children to camp. They mingled over a few sausages and burgers from the BBQ and then worked together to beat the tutors at some fantastic L&E wide games. After some lovely hot chocolate and our weekly chant of ‘Be Kind, be kind, be kind’ it was time to go up to bed for some sleep. Everyone is very excited for what week 2, 2018 will bring. We are very proud to announce that we made it onto Tutorful’s Most Incredible UK Summer Camps list! Check out the full list here. Thank you so much to everyone who voted for us!!! 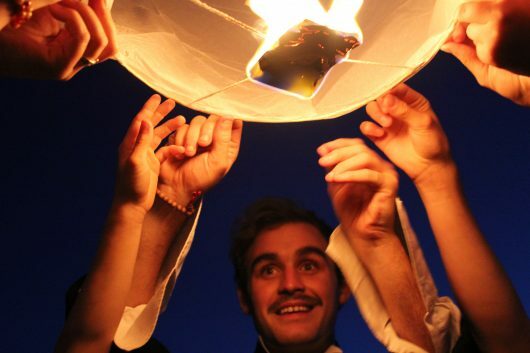 We work very hard to ensure our camps offer a unique cultural experience in a safe and enjoyable setting. We live by our motto that happy children thrive! Our 2018 camps are filling up very fast so please get in touch with us soon if you are considering a camp for your children – we promise to give them a summer of a lifetime! 5 reasons why every child should go to summer camp! Here at L&E we firmly believe that ‘Happy Children Thrive’ so that’s what we try to create a happy, inclusive, fun and unforgettable camp. We want your children to return to you with a new found sense of adventure, a long list of new friends and with a MASSIVE smile on their face! There are many firsts at camp. Some children have never been away from home before, some have never scuba dived or abseiled and some have never sang songs under the stars. Enjoying a ‘first’ is special enough but doing it whilst away from home is even more special. Your children will come back with many stories of camp and every story is an achievement and with each achievement they grew slightly taller as a result. 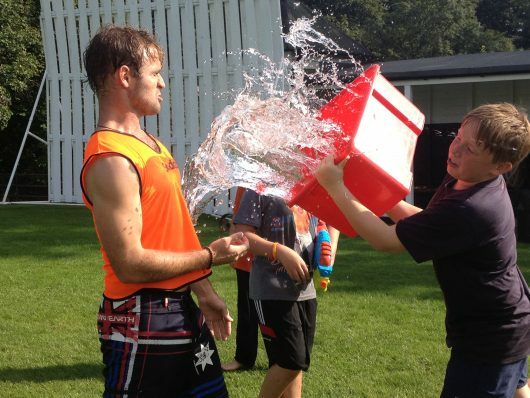 All throughout camp children find themselves in new situations with children they have never met before. Not only will they learn how to effectively communicate they will learn leadership skills and how to work in a team. With new responsibilities they will work with their new found friends to get the most out of camp. Our three rules at camp are ‘be kind, be kind, be kind’. 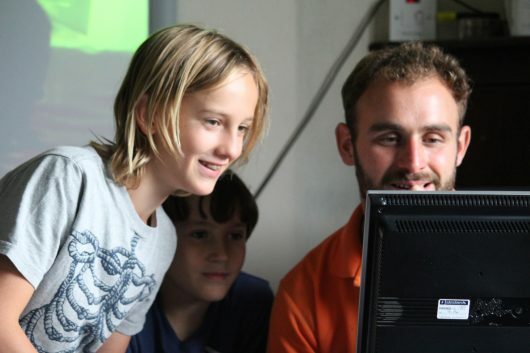 We feel that children become more understanding after spending time within the L&E community. 3. Physical activity is on the schedule! Each and every day the children have the opportunity to spend time outdoors. The L&E day is split into 3 parts which gives children the opportunity to be outside doing activities – some of the children even use their downtime to play outside. This structured and unstructured time spent in the fresh air is just what the doctor ordered. We know how important limiting screen time is and here at camp we fully understand that. Your children are very welcome to bring their phones to camp however we will look after them for the duration of their stay with us. Each day after dinner for around 30 minutes there is an opportunity for every child to get their phone to call home – this is the extent of the children’s phone use over the week!! There are so many different types of activities to choose from at camp, from abseiling to climbing, scuba diving to kayaking, geocaching to scavenger hunts. And it isn’t just during the activities where that ‘spark’ can occur, a song sung around the campfire can be just as magical. The list could go on and on!!! Summer camps truly are a special place for children to learn many skills and make friends for life. 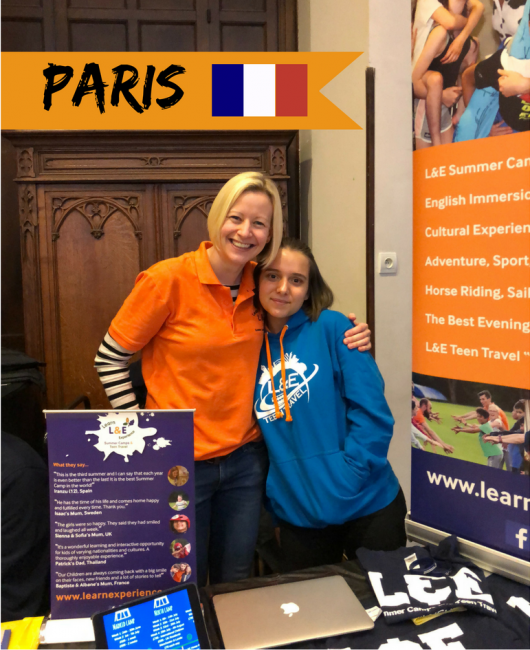 Here at L&E we love meeting new people and spreading the word about our amazing summer camps, and that is exactly what the L&E Road Trips are all about! This year, the L&E Road Trip saw us visit Milan, Paris and Munich where we met up with some old friends and made many new ones. Our meet-ups went very well and we were so happy to see so many of you and talk to you about our 2018 programmes. Our luck was in as we had some L&E Alumni to meet us in each destination who acted as L&E Ambassadors while we were in their city. Their help was invaluable!!!! Not only did they assist with the occasional language barrier, we got some personalised tours taking in the sights of their home town. There seemed to be some abnormal weather to greet us in both Paris & Munich. After weeks of rainfall before our arrival in Paris, the river Seine was swollen to four meters above its normal level for that time of year. Then when we arrived in Munich the temperature dropped to -10 degrees, which even for a Brit is pretty cold! 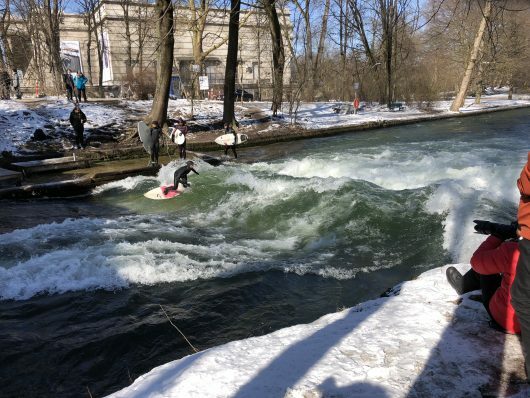 The cold weather did make for some amazing sights around Munich, the most amazing of which were the VERY brave surfers who took to the Eisbach which is a small channel of the Isar River. You really have to see it to believe it!!! We understand how tricky it can be choosing the right summer camp for your child, this is why we think the L&E Road Trips are so valuable to parents. 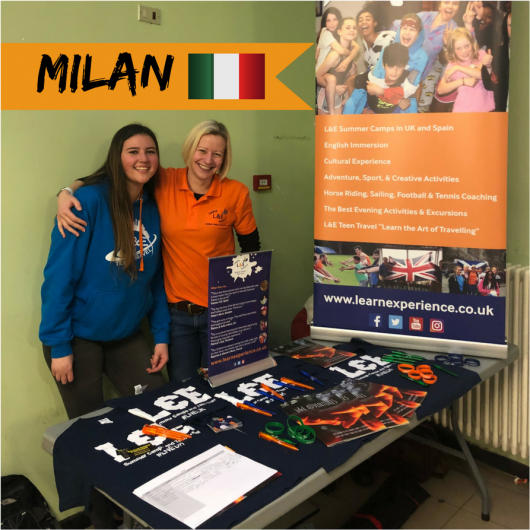 They offer the opportunity to meet an L&E representative and really get a feel for how our camps operate, and if they’re lucky, they’ll get to meet an ex-camper or a Teen Traveller, there is no greater insight than hearing it straight from the horses mouth!!! Our 2018/19 L&E Road Trip will be bigger and better than ever so keep your eyes peeled as we hope to come to a city near you.